Prime Minister is pushing to stiffen punishment for throwing rocks on moving vehicles and against security forces. Prime Minister Binyamin Netanyahu convened a discussion Monday on the security situation in Jerusalem, with the participation of Defense Minister Moshe Yaalon, Public Security Minister Yitzhak Aharonovich and Justice Minister Tzipi Livni. He gave instructions to speed up the legislation of a law stiffening punishment for rock throwers, in response to continued Arab violence in Jerusalem. 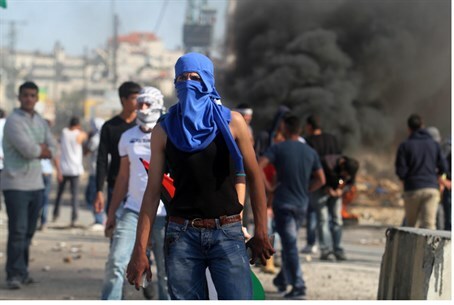 Representatives of the State Attorney's Office said that they have already given instructions to get tougher in arresting and punishing rock throwers, and have drawn up criteria for placing financial sanctions on the parents of rock throwers as well, in certain cases. Throwing rocks at a moving vehicle would be punishable by up to 10 years in jail, according to the new law, and throwing rocks at a moving vehicle with intent to injure could be punished by up to 20 years. In addition, throwing rocks at security officers could involve a 5-year sentence. Rocks hurled by rioters have caused serious injury and even death in the past, particularly when targeting speeding cars. Children are particularly vulnerable to such attacks, and scores of Israeli children and infants have been wounded or killed by Arab extremists using such tactics. Although often referred to as "stone-throwers," projectiles hurled by attackers can range from fist-sized rocks to bricks, chunks of concrete and cinder blocks. The gathered officials received a briefing on the police's extensive activity in the areas of Jerusalem that are plagued by rioting, including reinforcement of the force that was in place and the use of aerial reconnaissance. Netanyahu also emphasized the need to debunk the campaign of incitement against Israel regarding events at the Temple Mount. The campaign, he said, is being led by extremist Islamist elements and by Palestinian Authority Chairman Mahmoud Abbas. He insisted that there is no change in the status quo on the Temple Mount and no intention to carry out such a change. Also taking part in the discussion were Jerusalem Mayor Nir Barkat, Shin Bet (ISA) Chief Yoram Cohen, and Jerusalem Police Chief Major Geneal Moshe (“Chico”) Edri.